Strap in: The brand's quest to become supreme leader of everything bathroom is far from over. Dollar Shave Club: Bucker of trends, direct-to-consumer poster child and -- now -- legacy brand. The company’s journey from 2011 viral launch video to 2016 $1B Unilever sale to the challenges it faces today building out long-term performance is nothing short of a roller coaster consumers have had the thrill of riding. Now, the brand is grappling with its transition from underdog to category king. It’s a frontline Dollar Shave Club’s VP of brand communications, Raechelle Hoki, has been fighting on since she joined the firm five-and-a-half years ago. 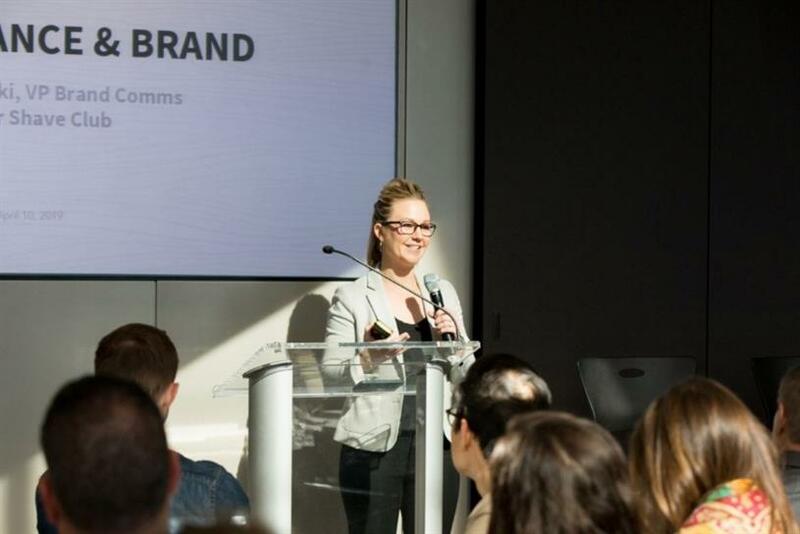 "As a marketer coming into Dollar Shave Club, the bar was set really high," she told a crowd at Campaign US’ Breakfast Briefing in association with iCrossing in New York City on Wednesday. "The launch video is what set the stage for Dollar Shave Club to be a brand. I don’t think Mike [founder] knew that going into the production of this -- I think he was just in the mindset of taking a big swing, being super brave and getting the brand and business out there. "We had our DNA already built for us with a very distinct voice. The challenge was how do we extend that DNA through everything we do?" Its early viral success well and truly set the stage. Dollar Shave Club saw explosive growth on key performance channels like paid Facebook, search and native after the F-you message to the razor world (which crashed the website and has amassed more than 26 million views on YouTube to this day) . The brand began to experiment with work to build its long-term performance. One of its most successful campaigns was an image of two identical razors labeled "HIS" and "HERS." You will find this work repackaged and repurposed 1,001 different ways. That was the intention. "This ad took about five minutes to design and we squeezed every ounce that this ad was worth to us -- we changed the background 100,000 times, we changed the composition, we changed the headline because it was really a top performer," Hoki continued. "I fundamentally believe that regardless of whether you’re in a performance channel or brand channel -- however it’s defined -- you are building a brand every step of the way at every interaction. We need to constantly remind the consumer who the brand is. It takes 100 ideas to find one or two that really stick with the consumer and they become the drivers of volume for you." "HIS and HERS" was the impetus for Dollar Shave Club’s in-house agency. Hoki said it was key because the brand needed to act quickly and have resources at the ready. High-level agency talent was snagged and asked to pivot from writing big, splashy commercials to zoning in on mediums closer to the brand’s heart, like Facebook ads. Hoki admitted the transition was challenging, but now the in-house team churns out quality work at volume and for little-to-no budget. Dollar Shave Club had won the razor space easily. But the ground underneath the crowded bathroom product category was rumbling with immense change. In order for the business to grow, marketers knew it had to expand outside of razors. The company has always offered other products, but that story had never really been told. This all changed last summer with the launch of "Get Ready" -- a three-minute digutal spot aimed realigning brand focus. Hokie said: "What we found really challenging is that it’s easy to get someone to buy a product from you, but as soon as your value proposition expands and you say ‘nevermind, totally take everything out of your bathroom and let us fill all those products and categories that you use every single day,’ that’s a much bigger commitment that you’re asking from the consumer. And the tactics you use to do so have to be different. "We were seeing not as much growth as we’d hoped in this category using traditional performance channels. So we had to go through a brand exploration and better discovering who we are. "‘Get Ready’ was a really fun assignment and a monumental production challenge. And it was the first big sign of bravery as a brand to tell the world who we want to be." The team struggled to measure its success in the aftermath because so many previous wins were measured with the short-term performance metrics Dollar Shave Club was built on. Regardless, Hokie hails the combination of brand DNA and long-term performance this campaign offers up as a triumph. But she’s no fool to the immense challenges which lie ahead in the DTC’s quest to solidify itself as supreme category ruler without compromising on the core values for which consumers first fell in love with Dollar Shave Club. She added: "We’re still actively pursuing a healthy marriage of brand and performance and we will continue to do it because our belief is that if we’re not having fun as a brand then consumers can’t have fun with us."